Pop quiz: In the past 24 hours, what have nine in ten U.S. consumers had? If you answered “a snack,” then you’d be on trend, on point and on topic with the most profound change occurring in America’s consumers’ eating and drinking behaviors. Snacking is now so entwined in our food and beverage culture that it makes up fully half of all eating occasions, and 92 percent of us snack sometime throughout the course of an average day. Our research finds that modern food and beverage culture is marked by fragmentation and an upending of tradition. While culturally we idealize three balanced meals a day, we rarely eat that way. Today, meal planning, shopping and cooking is decentralized, and there are fewer rules about what to eat and drink. In fact, we’re much more comfortable with eating on the fly. Eating and drinking can happen anywhere and everywhere and at any time. No eating or drinking occasion typifies the fragmented, decentralized and no-rules modern food and beverage culture more than snacking. It’s little wonder then why forward-thinking food manufacturers, retailers and food service operators are in a race to reformulate, repackage, reportion and revamp products and menus to better fit with these changing eating and drinking habits. How did we get here? When did the notion of “three squares a day” get tossed aside? As many born before the 1970s are well aware, snacking was never practiced to anywhere near the levels of today, if at all. To really grasp this profound change in America’s eating behavior and practices, The Hartman Group’s social scientists and analysts (after years of research) found that this behavior can be best understood at the level of occasions. Snacking is no longer about a specific product category but rather about a set of behaviors — a way of eating and drinking — a kind of occasion. In other words, anything and everything can be a snack — and increasingly is. Our Culture of Food 2015: New Appetites, New Routines report details the shifts that lead to snacking, describing how consumers eat around their schedules rather than scheduling around mealtimes. Dinner has become a mere pause between other activities. Lunch is often scheduled out to accommodate an overflow of meetings and must-do’s. And breakfast can be multitasked between commuting and working. This is our modern time deficient, which is heavily influencing an ad hoc shift in eating styles. While a good deal of the shifts in food and beverage culture have been towards fresher and less processed foods, the fact is that we are giving up meal occasions with others or combining eating with other tasks as the need for productivity compels us to move forward. Many consumers also believe that hectic American lifestyles lead to poor eating habits. Beyond the increased frequency with which we snack, snacks themselves have evolved far beyond conventional categories to include fresh items and higher-quality products and involve both food and beverage items. 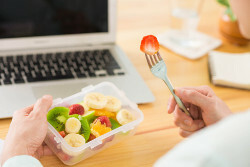 Snacking is becoming healthier, and healthy snacking is as much about ways of eating as it is about product attributes, with beliefs that eating small amounts of food every few hours is healthier than eating three big meals a day, that distributing small treat moments helps to avoid overindulgent binges and that overall balance can be achieved by rotating indulgent and non-indulgent. In today’s snackified culture, virtually any food or beverage product can become a snack. 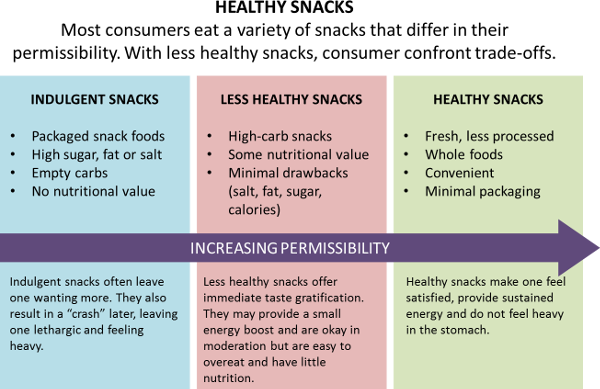 Snacking is not about types of food or beverage but how that food or drink is consumed. The word "snack" has been broadened to include much more than the traditional "sweets" or "salty" crackers. Now, even a slice of pizza or a smoothie in between meals might be described as a "snack." While a "meal" still requires chewing, a snack no longer does. Although occasionally one individual may decide that your product fits a specific occasion and consume it only then, what about the thousands of others? A sky-high, aggregate view of food and beverage products would make it apparent how easily the same product moves in and out of snack occasions and in and out of the fluid "snack" category altogether. The implication here is that that marketers may find that their view of their food or beverage is much narrower than that of its consumers. The very same food product may function as an in-between-meal "snack" one day, as lunch the next and as an afternoon munchie the following day. Importantly, the fact that your product may be a meal component one day and a snack the next is not harmful confusion but rather a beneficial ambiguity. It extends the social life of your product and brand, expanding the usefulness of it in your consumers' everyday lives. Some of the most interesting incremental growth opportunities lie in the snacking margins of our everyday food culture.